The more I visit this city, the smaller it gets….meaning, the better I know it, the easier it is to get around. And it’s a fun city to play in. 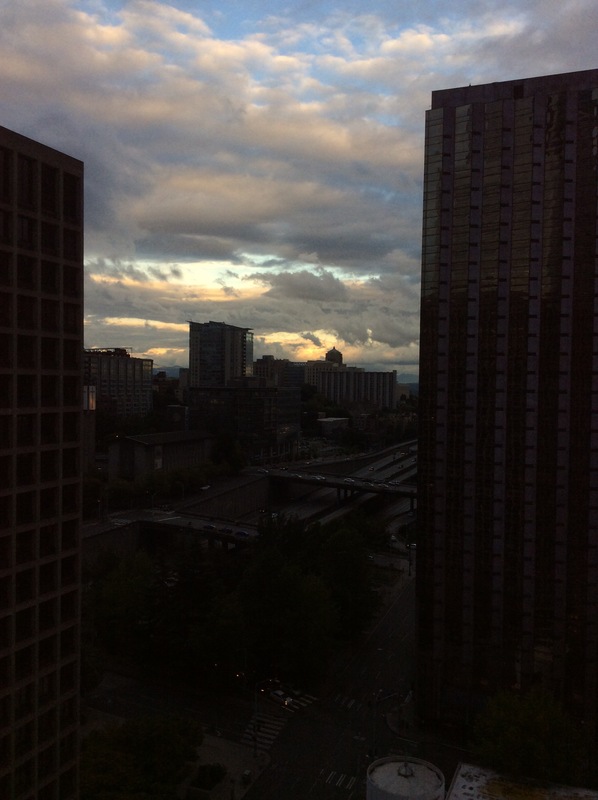 Here is a lovely view of I-5 at dusk from our hotel window. I’m sorry I don’t have other pics at the moment. My iPad isn’t talking with my iPhone unless my MacBook Air, which is at home, mediates. Geez….touchy electronics. I really don’t know why they have to squabble, but they do. My highlights of the day were the octopus at the Aquarium, the harbor cruise and the RGB Moscow Mule. Okay….this is a quick post with lots of fluff and very little content. I wonder if it’s the same octopus who regularly escaped from its tank, went through two doors, and down a long hall to get to the tidepool display and gorge on the octopus equivalent of hot fudge sundaes? My ex Monte’s daughter Debbie was (and probably still is) an aquarium volunteer, and her stories about that octopus were amazing and incredibly funny. I’m not sure f it’s the same one, but I heard the stories about that one. He was eating all the tropical fish! Very intelligent beasties.